All boats are affected by active use. 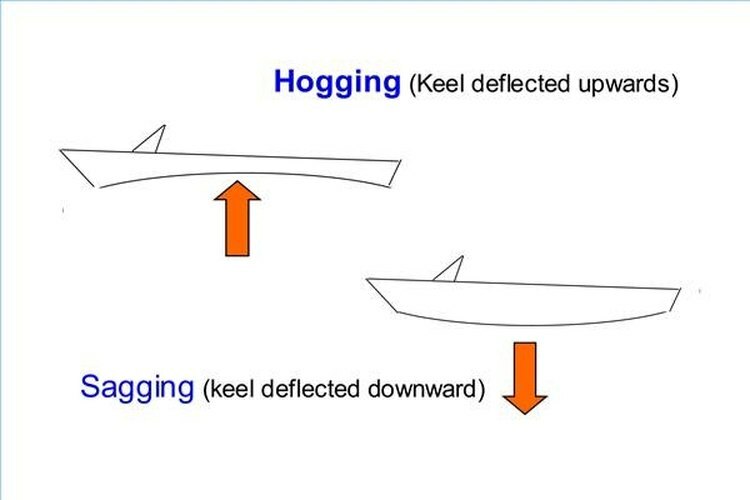 The momentary longitudinal stresses on any boat hull--known as "hogging," where the center of the hull structure is deflected upward by a wave while the bow and stern sag, and "sagging," where the mid-hull is deflected downward while the ends rise--are cumulative. Although the structural members of the hull are designed to accommodate for these stresses by flexing, the skin of a fiberglass boat is rigid and responds to these forces and effects by developing weak spots where the fiberglass attempts to stretch. You can repair this damage in a weekend. Use a palm sander to sand the weak spot below the level of the sound fiberglass surrounding the weakened area . Since the fiberglass has already thinned or cracked, you may sand all the way through the fiberglass in spots. Use the resin-based putty to fill in the depression or hole, working the putty into the depths of the damaged area carefully with the small-blade putty knife; use the large-blade putty knife to fill in the rest of the damage. The putty should be slightly higher than the sound surface and should be slightly humped: it will shrink as it cures. Let the putty cure for at least 24 hours . Sand the putty down to the level of the sound surface with the palm sander and 00 grit sandpaper. Fill any voids in the surface of the putty, wait 24 hours and sand again with 00 grit sandpaper. While you wait for the putty to cure, cut the fiberglass sheeting to a size that will cover the repaired area and "sister" the repair, strengthening the weak spot and providing the surface to be finished. Mix the epoxy resin and hardener only when you are ready to begin the patching process. With a paint roller, apply a thin coat of epoxy to the areas you sanded. Apply the fiberglass patch to the epoxied areas immediately. Wait 24 hours for the epoxy to set. With the palm sander and 000 grit sandpaper, sand the fiberglass surface down until it is level with the surrounding hull surface and paint with the acrylic epoxy paint. Allow the paint to dry completely, then apply the gelcoat according to the product instructions. When you "sister" a weak spot, it means you are adding additional support to an existing structure, reinforcing it. Apply the epoxy to the surface in small increments, since it will begin to set immediately. The weak spots will be small, but make sure that the area you are working on is small enough to allow you to apply the fiberglass before the epoxy begins to set. Work with 2-part epoxy should be done in a well ventilated area. Wear gloves, a mask, safety glasses and long sleeves when working with fiberglass.